Previously used as a rehabilitation home. Property has total of nine bedrooms. Four bedrooms (double occupancy) and one full bath upstairs and three bedrooms (double occupancy) and two full baths downstairs. An additional two, single occupancy bedrooms are downstairs. One with an attached bath that connects to the laundry room, currently used as an office and another currently used as a therapy room. There is also a large kitchen area, common areas, and an office. 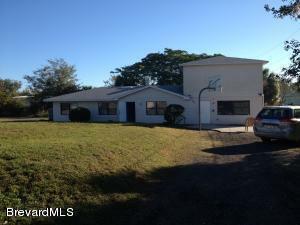 All located on a large fenced lot centrally located close to I-95, State Road 520, and US1. Current zoning is BU2. County will allow up to 16 beds depending on usage. Includes vacant lot attached on North side. Also for lease. Owner financing available.